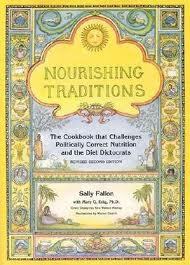 It is called Nourishing Traditions -The Cookbook that Challenges Politically Correct Nutrition and the Diet Dictocrats -WHAT A SUBTITLE ! I love it! This is so much more than a cookbook. It is a whole way of life – it destroys and questions everything we have had banged into our heads by doctors and the media every since we have known. It is full of the most incredulous facts about what people eat in the world, all the rubbish we have been lead to believe about what we eat over the last 60 years. Let us take an example… The author talks about a British study where several thousand men were put into 2 groups. Group 1 were asked to stop smoking, reduced cholesterol and saturated fat and introduce margarine and vegetable oils. By the end of a year, this so called ‘GOOD GROUP’ has 100% MORE DEATHS than the so called bad group. The quote from the author of the study said ‘The implication for public health policy in the UK is that a preventative programme such as we evaluated in this trail is probably effective… ” ???? There is also such a thing as the ‘French Paradox’. Before the French discovered pre- packed food and coffee and bread for breakfast ( after 2nd world war) the ‘paradox ‘ was that they ate full fat and were healthier than people elsewhere in Europe…..Why is it a paradox, and not the truth? It seems that full fat is not the culprit. The author talks about how coronary heart disease was really rare in the 1920s in The US, and now it causes 40% of all deaths…..’paradoxically’ comparing 1910 and 1970, in 1970 people ate 21% less fat, butter consumption dropped from 18-4 p0unds a year, but margarine and vegetable oils rose by 400% and sugar and processed food grew by 600%. Sally Fallon’s work puts people in a huge spin. A lot of people just go into big denial, especially the purist vegetarians and diet feaks. The most regular argument against this traditional way of eating is that , we don’t move as much as our ancestors so don’t need to eat saturated fat.??????? I sometimes wonder if it some sort of conspiracy to make us eat cheap food, because there are so many more of us that we just cannot afford to feed us all on ‘good traditional food’. And we believe the hype, which is probably why Pret have stopped selling whole organic milk because most of their customers think taking the fat out is better as they have been totally indoctrinated all their lives to believing low-fat is better for you. ( interesting thing about the risks to health from removing the fat from milk in this book too). There is so much more…600 pages in fact.It makes for a great read if you have any interest in the hype surrounding what we have been told is good and bad for us, and also has some mighty fine recipes and quotes from so many amazing sources. Heard this for the first time today…wildly good. I am now a fan.